Sabre Red Travel SolutionYour total travel solution to drive customer loyalty and power business performance. Sabre Travel Network® is the partner of choice for the world's leading travel agencies and corporate travel programs. So how can we help you continue to stay ahead of the rest? The answer is Sabre® Red™, our innovative total travel solution. It features a portfolio of award-winning capabilities and applications. These tools allow you to design and deliver a differentiated customer experience through a simplified workflow. Put simply? You can provide great value and service while capturing increased revenue more efficiently. Sabre® gives you access to the most well-rounded, accurate and best-priced travel options in the world. Our breadth of inventory and leading shopping capability ensure that you'll easily find exactly what your travellers need. This includes content from airlines, hotel, car, rail and tour options around the world. Provide unparalleled, personalised service, and you'll win customer loyalty, repeat business and more money to the bottom line. In today's competitive business environment, we give you the tools to make yourself stand out and serve customers better. Lower operating costs and increase revenue - this is key to achieving success in profitability. Increase preferred supplier sales by up to 20 percent. Boost overrides by up to 10 percent. Not only will you achieve profitability goals, you will exceed them. Operate more efficiently and streamline operations. We offer workflow management solutions, process automation tools and consulting services. Move fluidly from request to reservation with time-saving, turbo-charged tools. Automate complex processes, freeing time to serve more customers. And increase productivity for even the most experienced agents. 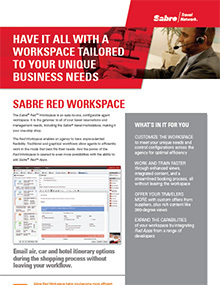 Download the Sabre Red Workspace overview.